The 3D earthquake disaster movie will rumble to $40 million in its box office debut for New Line and Warner Bros. this weekend, bullish analysts predict. That should be plenty to knock off the reigning No. 1 movie “Tomorrowland” and the weekend’s other wide opener, “Aloha,” which is written and directed by Cameron Crowe. Sony’s romantic comedy starring Bradley Cooper, Emma Stone, Rachel McAdams and Bill Murray has had a hard time overcoming negative buzz that began last December, when hacked emails from former studio chairwoman Amy Pascal surfaced in which she called the script “ridiculous.” It’s looking at a debut in the $15 million range, say the analysts, though the studio is more conservative in its projection. The vital signs are mixed on the $110 million action extravaganza, which co-stars Paul Giamatti, Carla Gugino, Alexandra Daddario and Ioan Gruffudd. The reviews are weak and it’s at 32 percent positive on Rotten Tomatoes. It’s ahead of “Noah,” which opened to $43 million in March 2014, on Facebook, though behind it on Twitter. It was the top-seller Wednesday morning at Fandango, however. 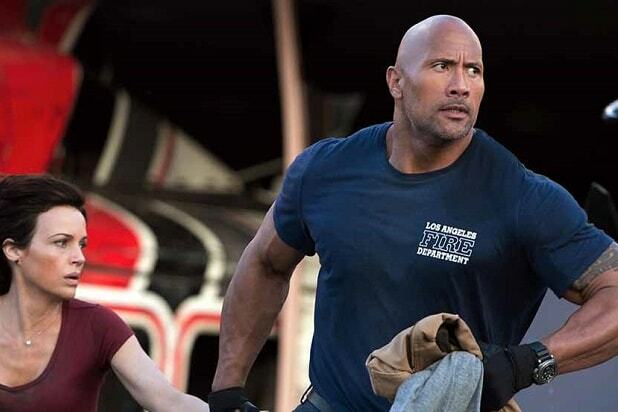 The only suspense going into this weekend is over just how high the effects-heavy “San Andreas” can go. Moviegoers may take a box office breather after a hit-crowded May and a long but underwhelming Memorial Day weekend. Warner Bros. will roll “San Andreas” out to a healthy 3,777 theaters, including 360 IMAX screens.